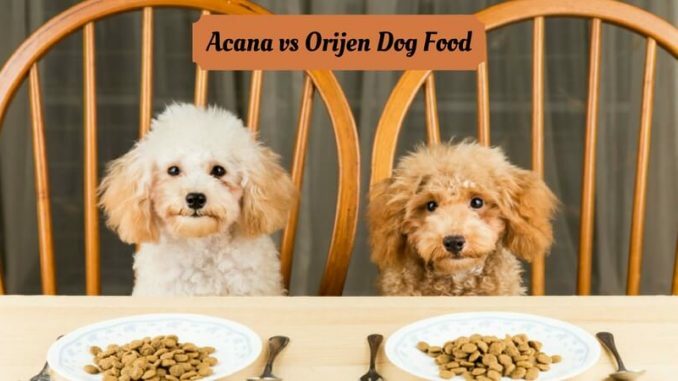 Acana vs Orijen Dog Food - Which One is Best? Home » Pet Supplies » Acana vs Orijen Dog Food – Which One is Best? As a pet parent, you must be concerned about the healthy diet of your valued furry friend so that he can enjoy sound body. By providing the nutritious food, your pet’s life will be extended to the longer period. It would be great if you make your pet consume “biologically appropriate” food stuff which is high in quality so that your pooch enjoys wholesome and nutritionally balanced diet.In the market, the top brands- Acana and Orijen dog foods are available for your canine. Here in this post, I will draw the comparisons between Acana vs Orijen so that you can become aware of the benefits and effects of the same and can choose the best among them for your pup. Carbohydrate Level- The carbohydrate formula is high in Acana as compare to Orijen which holds near about 5-8 % less carbohydrate level. Protein Source- In one single recipe, your pooch will have five different animal protein sources by consuming Orijen dog food while not more than three separate animal protein sources from Acana food. Fresh Meat- 2/3 new types of meat are found in Orijen food whereas 1/2 in Acana dog food. Formula Variety- Acana pooch food enjoys the extensive range of formula variety than the Orijen dog food. If you go for Orijen foodstuff for your puppy, then you may not meet the particular requirement of your pet. Within your means- If you prefer affordable dog food then choose Acana which is within your means as Orijen are comparatively expensive. The acana is considered regionals dog food as it is produced in Kentucky area. If your canine suffers from allergies or sensitive stomachs, then you should make use of Acana regionals as it enjoys single protein source. The orijen senior dog food covers two types of food; one is dry food, and the other is freeze dried food. You can choose Orijen dry food for your senior dog which will enjoy three varieties of freeze-dried food and seven varieties of dry food. To some extent, larger types of foods are covered by Acana than Orijen senior that covers only dry food and freeze dried food. Cost wise you will find Acana dog food more reasonable than Orijen. The Acana Wild prairie dog food is grain free that will keep your loving pet secure and healthy as all the ingredients are of high-quality. You will find it balanced dog food. Biologically Appropriate – Both types of dog food Acana and Orijen are biologically appropriate that means both enjoy high meat content with diverse meat constituents. They contain fruits, vegetables and the abundant amount of protein with less amount of carbohydrates. As you know, Acana has a little high amount of carbohydrate than Orijen, but the crabs are low glycemic which helps in maintaining blood sugar. The low glycemic carbs are chickpeas, lentils and much more. Both the types; Orijen and Acana dog food enjoy the benefits so how to decide which is best for your beloved canine. Well, it depends on your pet’s requirement and also on the way you take care of your dear pet. If you don’t want to spend much on dog food and can compensate with the nutritive quality, or your pooch does not require high protein content and are comfortable with little more amount of carbohydrate content and less amount of protein, then Acana is the suitable choice for your pet. In case you are willing to offer high protein content and fresh meat with less carbohydrate count then Orijen is apt dog food. In every formula, it contains rich sources of animal meat. You can also check the Orijen dog food reviews online which will let you know what the real dog owners like about it. The cost of dog foods matters if you have to look after multiple dogs at the dog centers or at or your home. But even if you opt for Acana dog food then also you can serve nutritious food to your canine as it is considered quality food meant for dogs as compared to other brands available on the market. You can buy it for commercial dogs as it will be better than usual standard brands due to their quality ingredients. You have to face trial and error to choose the proper dog food for your precious pet. Keep in mind the requirements so that you can make the best choice.